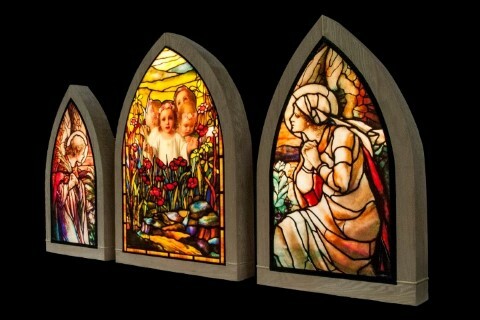 LED Backlit Windows - Stained Glass Inc.
Everyone loves beautiful stained glass art. Now it can be used anywhere. Internally lit stained glass artwork, or light boxes, hang on the wall. These "windowless windows" create the appearance of a stained glass window, without the window. You simply switch them on and enjoy stained glass, anytime, day or night. The diffused, even glow through the stained glass artwork creates a more inspiring, comfortable and less unobtrusive environment for worship. Use just a single design, a series of designs or cover an entire wall in stained glass. You can select from our collection (the world's largest) of stained glass images, you can have an existing design modified to meet your needs, or we can work with you on a completely new design. Available in your choice of beautiful frames, the artwork is illuminated with LED lights rated for 30,000 hours of use without changing a bulb (equal to about 40 years at 14 hrs. per week). Need assistance? 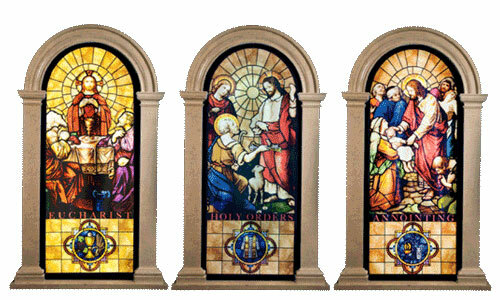 Our stained glass art designers are able to help you each step of the way. Questions? 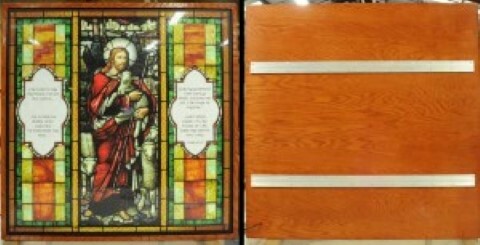 Contact us, we are here to help with your stained glass light box needs.